"New Brewery. - Mr. G. Joseph has bought the lot¹ on Main street, just below Phillips' iron foundry, and will at once commence the erection of a lager beer brewery. The contracts for excavating the cellar and lumber have already been given out, and the work will be gone on with immediately. When completed Walla Walla will boast two breweries², sufficient we think to meet the demands for lager beer." "...Joseph's new Brewery, which is just completed and will be turning out beer between this and Christmas." Gustave Joseph, a 50 year old, Swiss immigrant, had previously been the proprietor of the City Hotel. However, his financial situation appears to have been less than sufficient for this brewery venture - since the City Brewery could not have cornered the entire beer market. Less than a year into operation Joseph was faced with numerous legal actions for non-payment of Promissory Notes. The following year, in 1871, he was hit with more legal actions for bad notes, culminating in a foreclosure resulting from two Mechanic's Liens. Before the year was out, Joseph filed for bankruptcy. 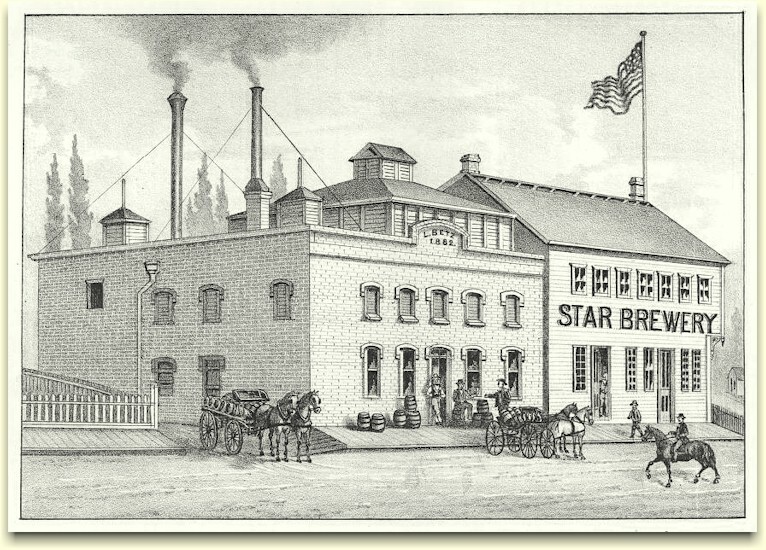 "STAR BREWERY - This well known establishment at the lower end of Main street, opposite the City Hotel is now prepared to serve the most excellent lager to its numerous customers and will furnish the same quality to families by the keg, at reasonable rates. George Seisser, proprietor." Seisser operated the Brewery for a few years when in 1874, Jacob Betz, an experienced brewer arrived from San Francisco and joined the company as plant superintendent. On November 6, 1875, an article in the Walla Walla Union reported that Seisser had sold the brewery to Betz. "Jacob Betz, ever a good citizen, active in support and furtherance of Tacoma's best interests, was born on the l0th of November, 1843, in the Rhine province of Bavaria, Germany. He was educated in the schools of Germany and America, having been brought to this country in 1848 when a little lad of but five summers. He arrived in California before the Civil war and there engaged in mining until 1870, when he removed to Walla Walla, Washington, where he erected a brewery which he operated for a long period." While he may have been involved in mining prior to 1870, he didn't go directly to Walla Walla after that. For the 1870 Census he was in San Francisco employed as a maltster, and the 1871 San Francisco City Directory lists Jacob Betz as a maltster with the Lyon Brewery. The 1872 SF city directory lists him as a brewer with the Jackson Brewery. 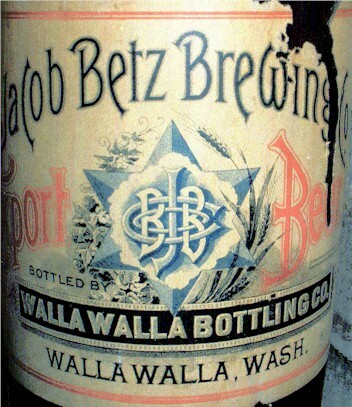 The directories for '72 and '73 don't list Betz, so he may have been working at some other western brewery, or he tried some mining prior to his 1874 arrival in Walla Walla. With the fast growing population, in part due to the completion of the trans-continental railway, production was not keeping up with demand. 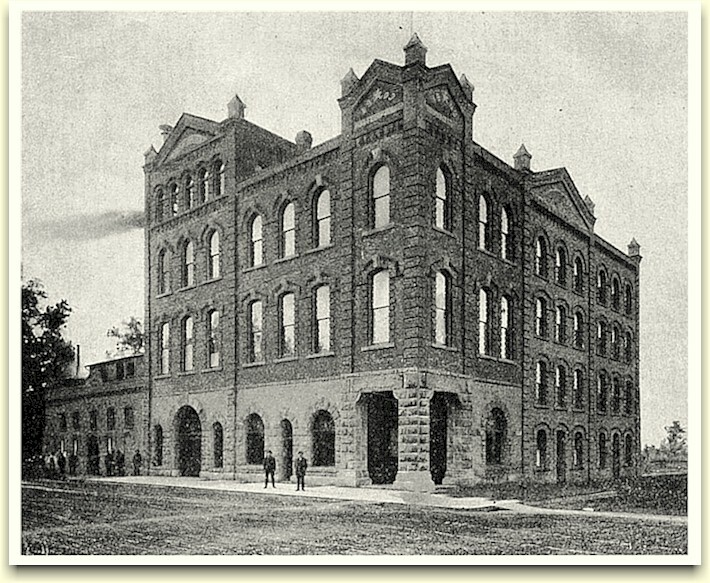 Consequently, in 1899, Betz enlarged the brewery with the addition of a four story, brick building erected on the 3rd street side, adjacent to the original wooden frame structure. The business was now operating as the Jacob Betz Brewing Co.
Like most brewers of the day the bulk of their output was sold by the keg to local saloons, with a portion bottled for export to outlying regions. Prior to 1890 it was required that the beer first be put in kegs, tax stamps applied, and then if it was to be bottled the kegs were transported to the bottling house - which was often an agent/distributor. Betz used the Walla Walla Bottling Company as his agent. The use of external bottling agents continued until the individual breweries found it more economical to install their own bottling works. An example of their label is shown below. 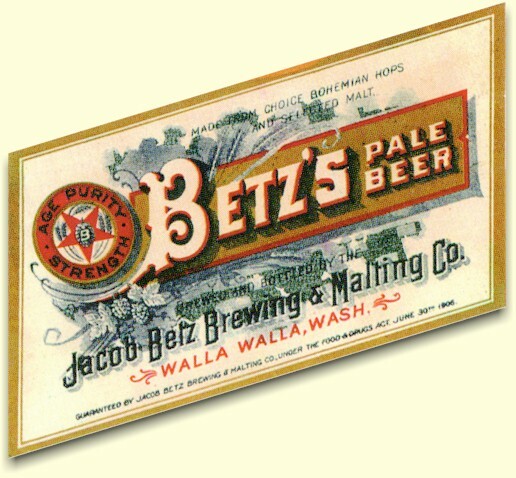 Betz eventually installed his own bottling shop, but not in or adjacent to the brewery. It was located across the street on the west side of 3rd. The beer was piped underground to the bottling works. Yesterday Jacob Betz began tearing down one of the old land marks of Walla Walla, the old wooden building at Alder and Third streets, preparatory to erecting a modern brewery, five stories in height. The immense structure will be completed some time next spring and will be one of the largest buildings in Walla Walla." The previous April Betz had revealed his plans for the $90,000 plant of brick, stone and steel, and was quoted as saying: " I want the property for Jacob Betz, Jr. We intend to erect not only the largest, but the best equipped building in Walla Walla." While Jacob Betz's plan for the new plant was fully realized, his desire that it be a legacy for his eldest son was not to be. On November 26, 1903, Jacob Betz, Jr. succumbed to a case of pneumonia. The senior Betz took the loss extremely hard and wanted nothing more to do with the new brewery. "The deal for the sale of the Betz brewery plant at Walla Walla to a syndicate of local saloonkeepers and capitalists has been practically closed. The consideration is $200,000, Jacob Betz agreeing to take $25,000 of the new company's stock." "Walla Walla, Saturday, April 2. - Formal transfer of the big Betz brewery here to the Jacob Betz Brewing & Malting Company, involving a $175,000 establishment, was made today. Betz keeps half interest in the plant. The officers of the new company are: president, Jacob Betz; vice president, John Bachhtold; secretary and treasurer, George Retzer; superintendent, Rudolph Gorsulowski. Trustees³ are: Jacob Betz, Albert Niebergall, George Reizer, John Bachtold, Lucien Geneway, Francis Talabere, and Rudolph Gowrsulowski." The following year Jacob Betz's stepped down as president and was replaced by John Bucholdt. While Betz held a major fiduciary interest in the company, he no longer played a management role, thus allowing him to focus on his Tacoma ventures. The label, shown here, carries the mandatory, albeit short lived, Food & Drug Act guarantee of June 30th 1906. The trapezoid shape of the label gave it a distinctive look when on the bottle. 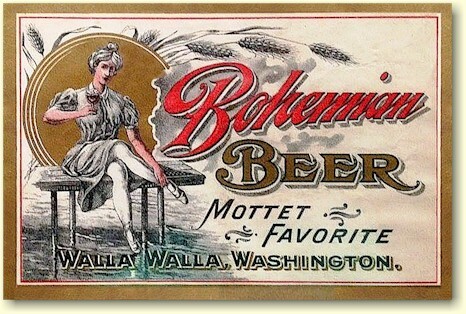 Two other Walla Walla beer labels, shown here, had perplexed collectors as it wasn't apparent which brewery had produced them. However, the answer was found after pouring over old newspapers of the early 1900s. The brewery's new ownership was mainly comprised of saloon owners, so they were able secure private labeling for their establishments. The city's largest saloon was the Idle Hour owned by George Mottet, who was also a real estate business partner with brewery president, Bucholdt. 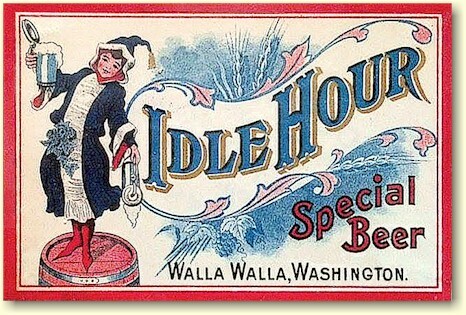 In Mottet's case, the brewery created a brew exclusively for him called "Idle Hour - Special Beer." They also made a Bohemian style beer with the slogan: "Mottet Favorite." Which was ironic in that the label depicted a "good time" girl, and Mottet's establishment was closed when his liquor license was revoked due to a violation of a 1910 ordinance enacted to curb prostitution. In 1910 their came another change to the company. On April 1st, Jacob Betz Brewing & Co. merged with the city's only other brewery, Stahl Brewing & Malting, to establish a new company. "About April 1, the two breweries existing in Walla Walla, Wash., the Stahl Brewing Co., one of the oldest in the state, and the Betz Brewing Co., were merged into a $300,00 corporation to be know as the Walla Walla Brewing Co. Both breweries will remain in operation for some time, but later on a $300,000 new plant will be erected on ground formerly purchased by Mr. Betz for that purpose. The competition between the two firms has been very active heretofore, and it was the idea of curtailing expenses that the deal, which had been pending for nearly two years, was consummated. Mr. Betz will take an extended trip to Europe in the near future. The Principal stockholders in the new concern are John Bachtold, George Retzer, J.G. Thomas, Albert Niebergail, J.J. Talabere, Adolph Schwarz, Waldemar Stockder, John Kremer and H.H. van Nattan, the last four coming from the Stahl, the first five from the Betz company." Rather than waiting until later to build the new brewery, construction began almost immediately. Nor did they wait to close the Betz plant, as stated in the above article. The old Star Brewery was closed before the year was out, and the building did not survive much longer. ¹ In 1927, the son of Jacob Betz was issued a Quit Claim Deed from the city of Walla Walla for the lot purchased by G. Joseph in 1869, and later re-sold to the senior Betz. The original deed on the lot was dated 15 March, 1866, and had been lost. ² The other brewery alluded to was Meyer's City Brewery, which would be purchased by John Stahl the following year - 1870. ³ Trustees are the major stockholders. A special thanks to Jeff Conradt for the "Mottet Favorite" label, the Jacob Betz billhead, c. 1904, the "Betz Beer" cap-lifter, and the Betz "Export Beer" label. Copyright © 2012 ~ All Rights Reserved.